From the Repertoire of Yuri Shishkin. I.Khandoshkin. RONDO «LA CHASSE». From the Concerto for viola and orchestra in С major. N.Rimsky-Korsakov. PROCESSION OF THE NOBLES. From the opera-ballet «Mlada». A.Grunfeld. SOIREES DE VIENNE. Concert paraphrase on waltz themes by J.Strauss. Video demo: Nikolai Rimsky-Korsakov. 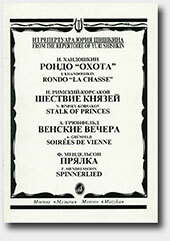 "Procession of the Nobles" from opera-ballet "Mlada".